Halloween is a holiday enjoyed by kids of all ages and many people decorate more for Halloween than they do for any other day of the year. As the weather turns cooler, indoor decorations become more important and nothing is more festive than Halloween floral arrangements greeting guests when they step inside. Have fun with these displays by sticking to traditional Halloween themes featuring orange and black, incorporating candy and including whimsical accents to make others smile. 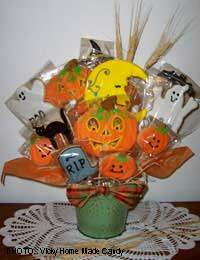 Halloween has such a variety of whimsical items associated with it that finding small decorative items to add to a bouquet should not be hard. Witches, witches hats, broomsticks, black cats, black crows, spiders, spider webs, jack o’lanterns, pumpkins, bats, gravestones, skeletons, skulls, coffins and haunted houses are just a few of the decorations commonly associated with this holiday. From small plastic figures and paper cut-outs inserted into bouquets to accompanying balloons or vases, there is much you can do to incorporate whimsical accents into your displays. If you’re really ambitious you could even create an large arrangement in the shape of one of these items. Creating Halloween arrangements is the perfect opportunity to let your creative side run wild. Feature a traditional orange and black colour scheme, incorporate candy into your displays and include whimsical accents to really get into the festive spirit.